Read about history of beach volleyball since becoming an Olympic sport. To find information how beach volleyball was invented and the early years, go to related pages in the bottom. 1994 - FIVB beach volleyball is one of the sports including in the Goodwill Games, held in St. Petersburg, Russia. The gold medals go to Bjorn Maaseide and Jan Kvalheim of Norway and Karolyn Kirby and Liz Masakayan of the United States. 1996 - The very first Olympic Beach Volleyball competition takes place in Atlanta Beach July 23-28 in a 10,000-seat stadium. 1996 - The first Olympic gold goes home with Karch Kiraly and Kent Steffes during the Atlanta Beach games. Kiraly also becomes a three-time gold medalist and earns the honor of being the first indoor and outdoor Olympic champ. Brazil's Jackie Silva and Sandra Pires bring home the gold for their country in women's competition. 1997 - During an AVP professional tour in the United States, Dain Blanton becomes the first African American to win a professional beach volleyball title. 1997 - Marseille, France, plays host to the first Men's and Women's World Championships organized in Europe. The games take place from July 21 to July 25. 2000 - Beach volleyball makes its second Olympic appearance at Bondi Beach near Sydney, Australia. Americans Dain Blanton and Eric Fonoimoana, the last team to qualify, takes home the gold. The women's gold medals go to Natalie Cook and Kerri-Ann Pottharst of the Australian team. 2002 - The court dimensions for beach volleyball are officially reduced to 8m by 8 m per side. 2004 - Beach volleyball makes its third showing during the Olympics when the games head to Athens, Greece. 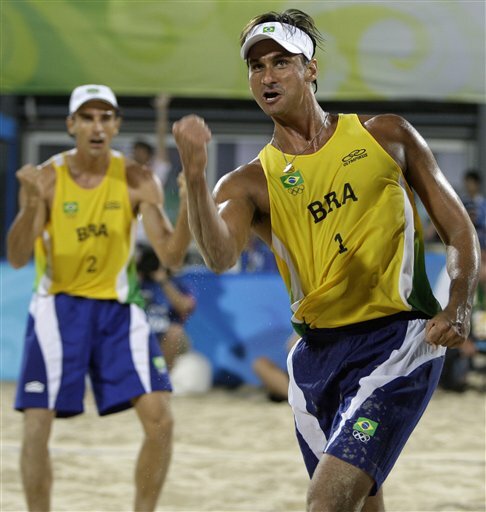 Third-time Olympic athlete Brazilian Emanuel Rego, the top-seeded player, wins the gold with partner Ricardo Santos. Americans Misty May and Kerri Walsh take home the gold in the women's competition. 2005 - Legendary player Karch Kiraly earns his last career victory, number 148, during the Huntington Beach AVP tournament. 2007 - Karch Kiraly retires from the game. He leaves behind a number of records, being known as the game's all-time wins leader and money earner. His impressive career included at least one tournament win in each of 24 different years. He made it to the semifinals in more than 75 percent of the events he ever played in. He was also named AVP's MVP a record six times. 2008 - Misty May Treanor and Kerri Walsh finally lose for the first time since Aug. 19, 2007. The loss breaks their consecutive tournament win streak at 19 and consecutive match winning streak at 112. The loss comes during the AVP tour final in Cincinnati, Ohio. 2008 - Beach volleyball makes its fourth Olympic appearance during the games at Chaoyang Park in Beijing, China. Americans win all around with Phil Dalhausser and Todd Rogers taking the men's competition and Misty May-Treanor and Kerri Walsh bringing home the gold in the women's division. May-Treanor and Walsh also become the very first team, men or women, to repeat as gold medalists.